Does Flooding Hurt the HVAC, Outside Condenser or a Package Unit? We had a very wet winter across the state of NC, and this spring, Charlotte residents are going to be faced with a new enemy of their home hvac systems, flooding! Sure, our air conditioners, heat pumps and packaged systems are outside and exposed to the weather year round, but what about sustained exposure to something as devastating as a flooded yard? In this Charlotte HVAC article, we take a look at what kind of damages you’re home hvac system may suffer after a flood, and what kinds of precautions you can take to protect the outdoor condensing unit or package unit. For the most part, an air conditioner or heat pump condensing unit is going to handle 12-16 inches of flood water just fine. Everything else is copper, aluminum or steel and is treated to be in the weather already. That said, the electrical components are the problem. An easy way for you tell how much water your unit is going to survive through is to look at any and all electrical connections on the system. The lowest point of an electrical item is the first point of failure! Gas Package units on the other hand, will not survive much of a flood at all! In fact, most gas packs have the heat exchanger and gas burners at or near ground level, so the minute the water starts rising, you can pretty much look at the unit as a failure. Assuming there are no punctured coils on the ac or heat pump unit, the repair can be as simple as replacing the circuit boards and any other electrical component that may have failed during the flood. Typically, circuit boards are replaced for anywhere between $150-$400 depending on the availability of the parts. Always get at least 2-3 quotes (Click here for 3 free repair estimates) since some contractors may charge 3-4 times as much as others. If you have any duct work under your home (flexible or solid) that should be thoroughly checked as well, to make sure the hvac duct system is free of all water and avoid future mold issues. Will Homeowners Insurance Cover the Damage? Depending on your insurance coverage and if you live in one of the flood zones around Charlotte, you may have coverage that takes care of flood damages. Like we mentioned in the article about lightning damages to HVAC earlier, it’s best to have this discussion with your homeowner insurance company. Water, specifically flood water, is hard to curtail! Sure, if you know ahead of time, you can shut off the power to the unit and remove the electrical components to a higher ground location and prevent them from shorting out. But for the most part… stacking sandbags around the system and hoping for the best is about the only option you have! 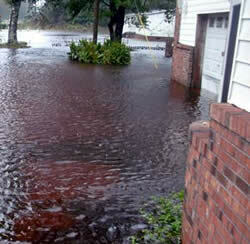 Aside from being prepared with the right kind of homeowner insurance, you truly are at the mercy of mother nature!